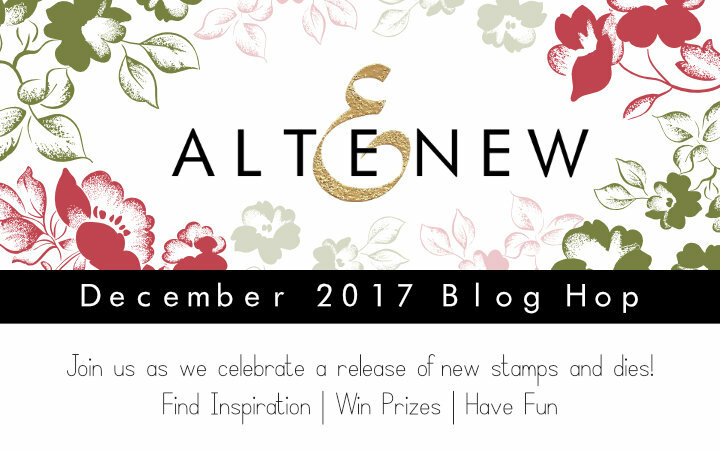 Altenew December Release Blog Hop + PRIZES! 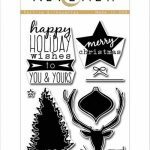 Hi there and welcome to my stop on the Altenew December release blog hop! I’m so glad you’re here! 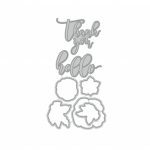 If you’ve been hopping along with us already you’ll have arrived here via Virginia Lu’s blog — love her to pieces! If you’re just now joining us or you encounter a broken link you can head on back to the start on the Altenew blog. 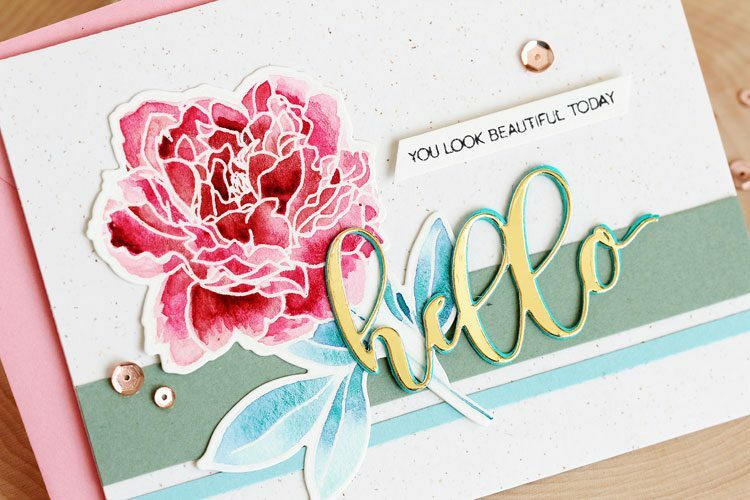 This release has so many great new products, including this Peony Spray and Flower Arrangement stamp sets and matching dies that I’ll be using today — LOVE! 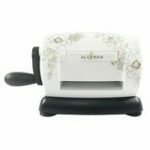 the cutest lil die cut machine EVER!!!! Ahhhh!!! Watch the video and see, plus I’m sharing a relaxing coloring technique too! Here’s a closer look at the cards from the video. First up, the two peony cards! I love how these came out, and how each one is a little different. 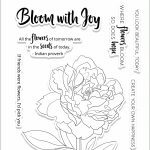 I started out by stamping the peonies on Canson XL watercolor paper with Altenew embossing ink and then heat embossed them with clear powder. I started with a super watery mix of Daniel Smith quinacridone rose and bronzite that I had leftover on a plate from another project and added color all over the flower, not really paying attention what I put where because it really doesn’t matter — that’s what I love about this technique! The more random the better for this step! 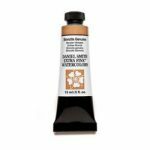 Then while that layer was still wet, I dropped in Daniel Smith perylene maroon for the darkest color and more quinacridone rose, this time at full strength! 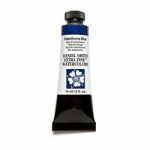 Then while it was still wet I dropped in Daniel Smith indanthrone blue — it’s so cool watching the colors blend as you tap them in! I die cut the sentiments from gold paper from the specialty paper pack and then stacked them up with the same die cut out of colored cardstock. 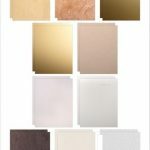 The mini die cut machine cut the gold paper no problem! I hope you can see all the little flecks in the paper that I used for the base card! 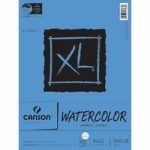 I think it goes great with watercolors! Annnd the gold paper is from the paper pack too. Then while I had my supplies out I had to make one more card with the Peony Spray! 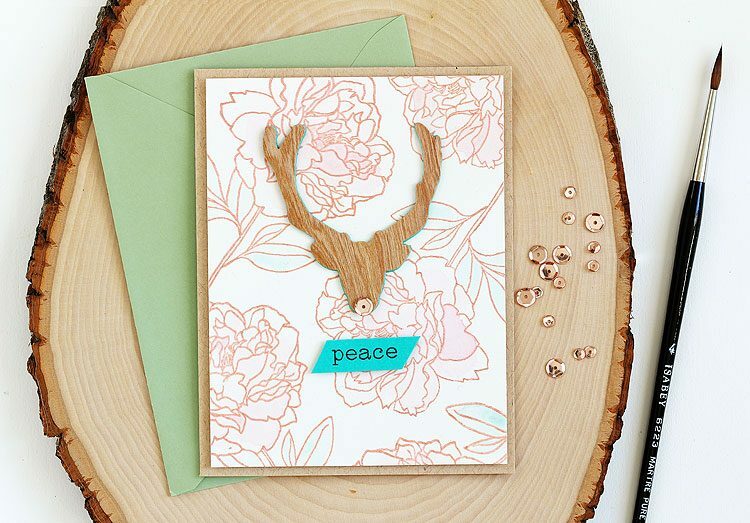 This deer card was totally inspired by the pattern on mini die cut machine! 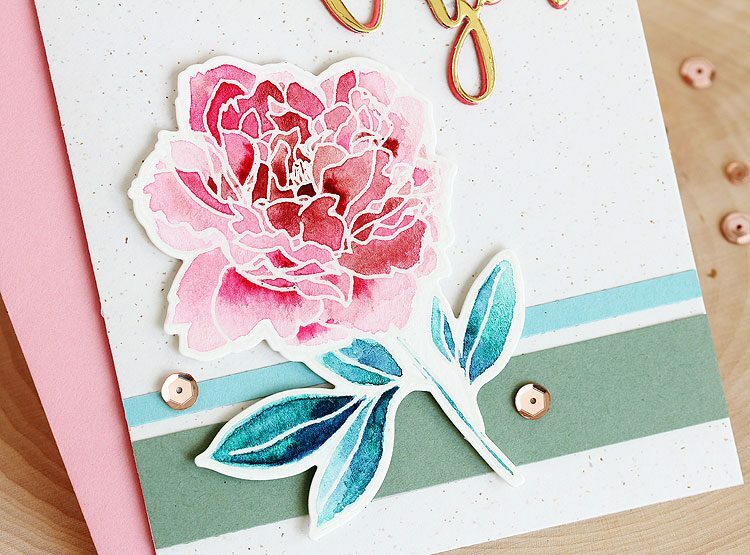 For this one, I stamped the Peony Spray in rose gold ink on Canson XL watercolor paper and then heat embossed with clear powder. 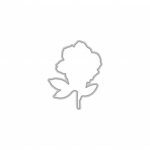 Then I very lightly colored in the peonies — there’s just a hint of color there. 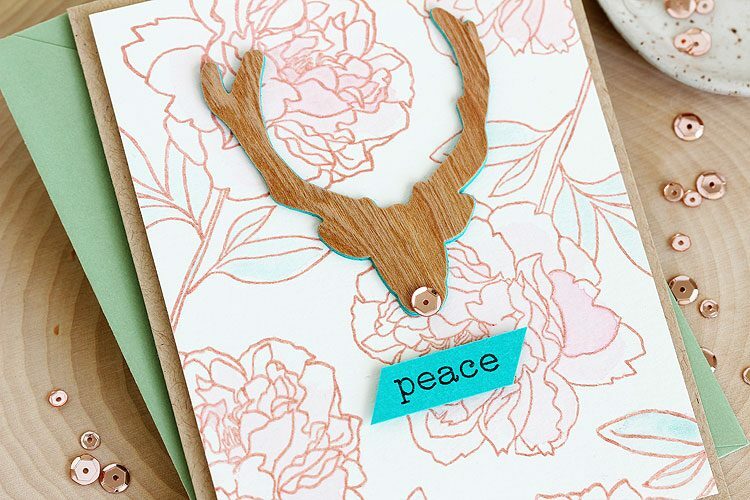 Then I die cut the deer from the Festive Silhouettes set from wood veneer paper that’s in the specialty paper pack — I couldn’t wait to see how the mini die cut machine handled it and I have to say that it cut like butter! Yeah!!! And I wasn’t done putting the mini die cut machine through her paces! I made one more card! 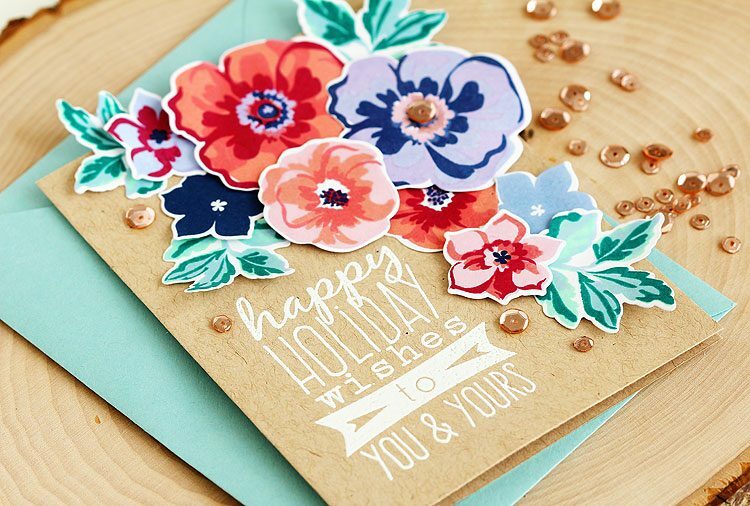 Next up, a card with the new Flower Arrangement stamp set and matching dies! 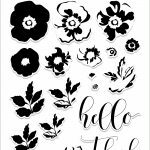 This set is BIG you all — it’s a 6×8 set full of petals, leaves and sentiments too! I had so much fun making this card! 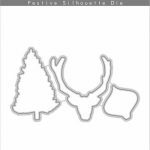 It’s full-on holiday mode around here, so I used a sentiment from the Festive Silhouettes set instead of the ones that come in the Flower Arrangement set itself. I took a photo of the mini die cut machine with the 6×8 Flower Arrangement stamp so that you could see them for comparison! Ahhhh that die cut machine really is the cutest EVER!!! Here are some closeups of the flowers for ya! Updated on December 18th: Hello! Comments are now closed! Thank you to everyone who hopped along — I loved reading all of your comments!The lucky random winner of my giveaway is Donna Mikasa! Yay! Donna, I emailed you! 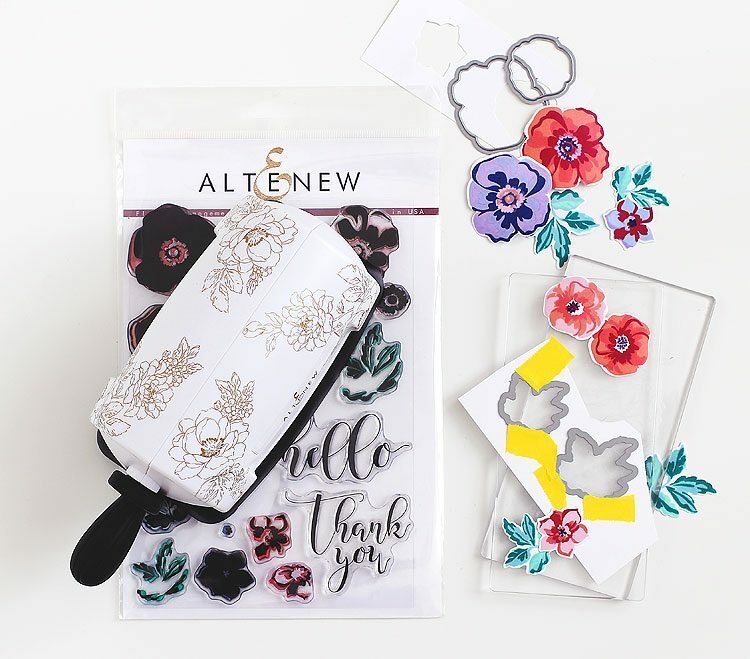 To see the list of winners from the Altenew blog, check out THIS post. And that’s not all! 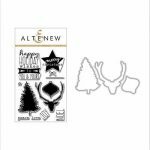 If you a comment HERE on my post, you’ll be entered to win a $30 gift certificate to Altenew! Yeah! I’ll announce the lucky random winner on December 16th. Your next stop on the hop is Lydia Evans — I can’t wait to see what she’s made! Here’s the full hop list! 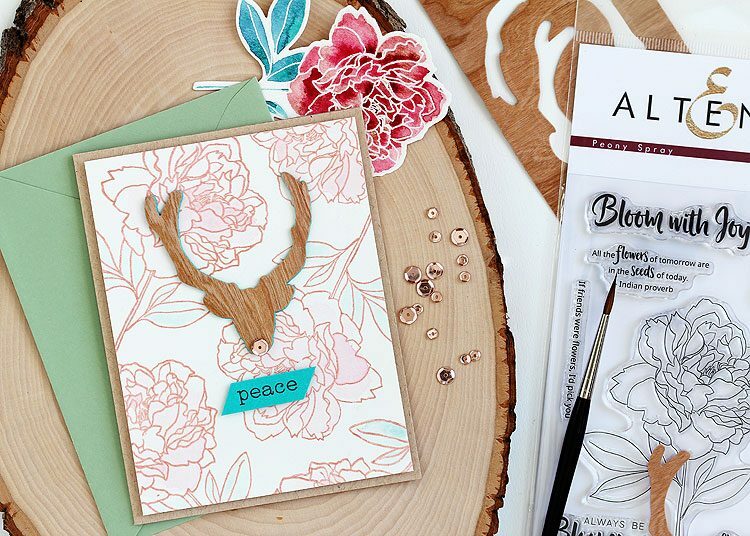 So many talented crafters and I’m happy to call so many of them friends and honored to be among them! Another watercolor technique with the BIG brush! Wow! I love you cards. 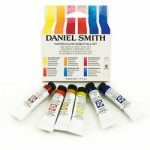 Your choice in colors in every single one is stunning and unique…..they really stand out and all of these are inspiring in every way. Beautiful cards. Everything in this release is gorgeous. Gorgeous colouring of the florals. Thanks for sharing your technique video. Thanks for the beautiful water color technique, I haven’t done much with water colors but I’m definitely giving this a try! 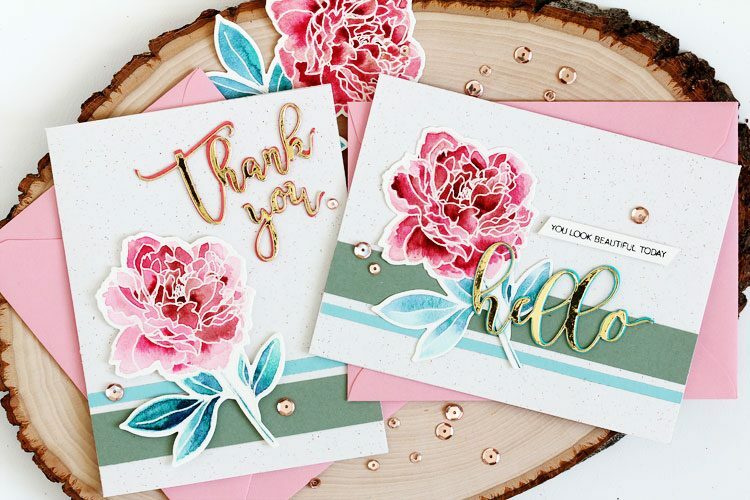 Your floral cards are absolutely beautiful! Beautiful watercolouring! Love the cards. 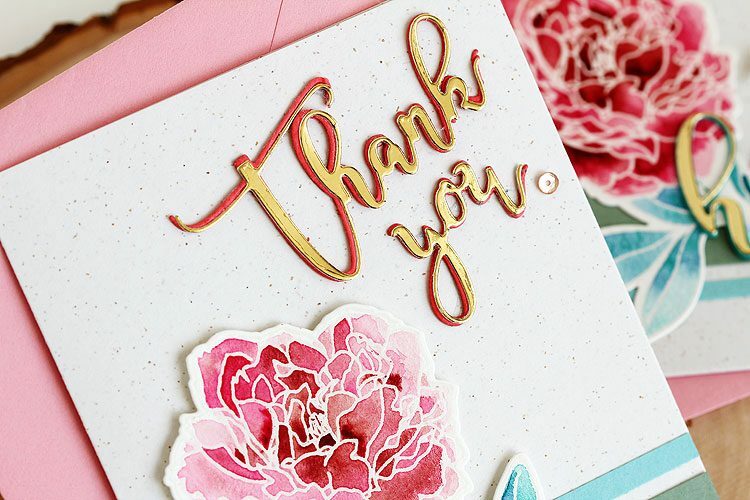 Beautiful cards…Each one is amazing and i like the peony cards..
Really pretty card! 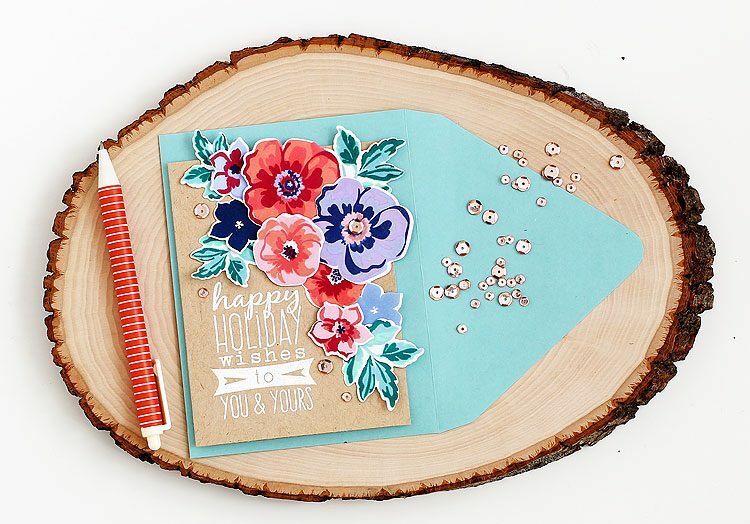 I love the non traditional holiday card design and colors. Great release! 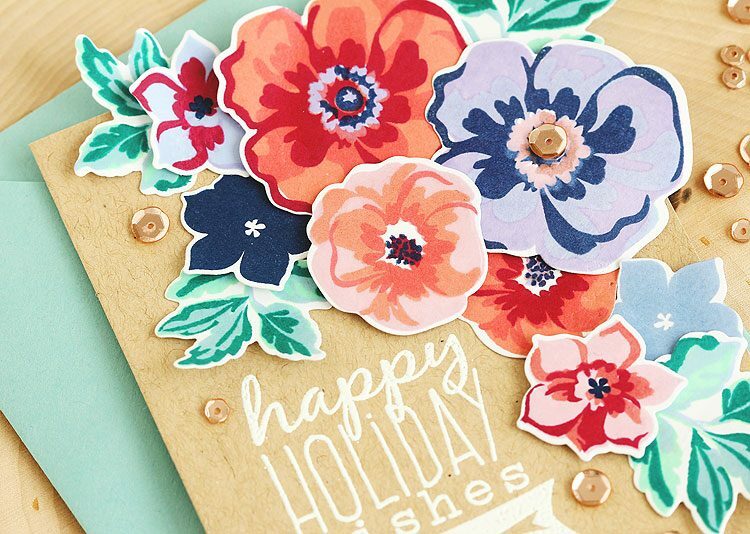 Wonderful variety of floral cards. Fantastic cards! 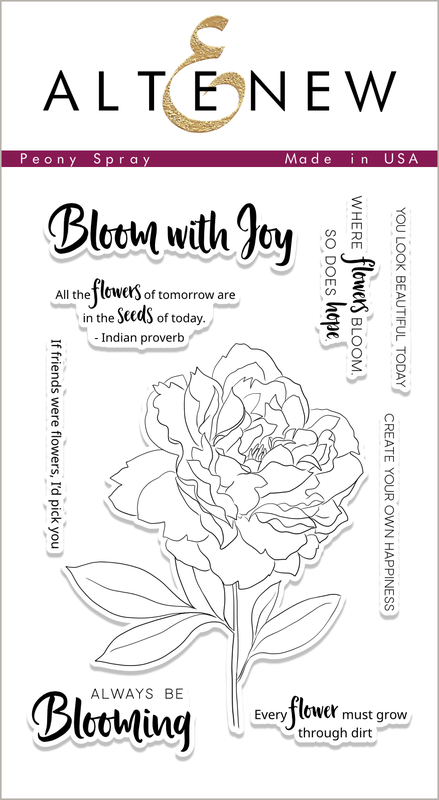 I love the design of the sentiments on the peonies cards! Beautiful cards! 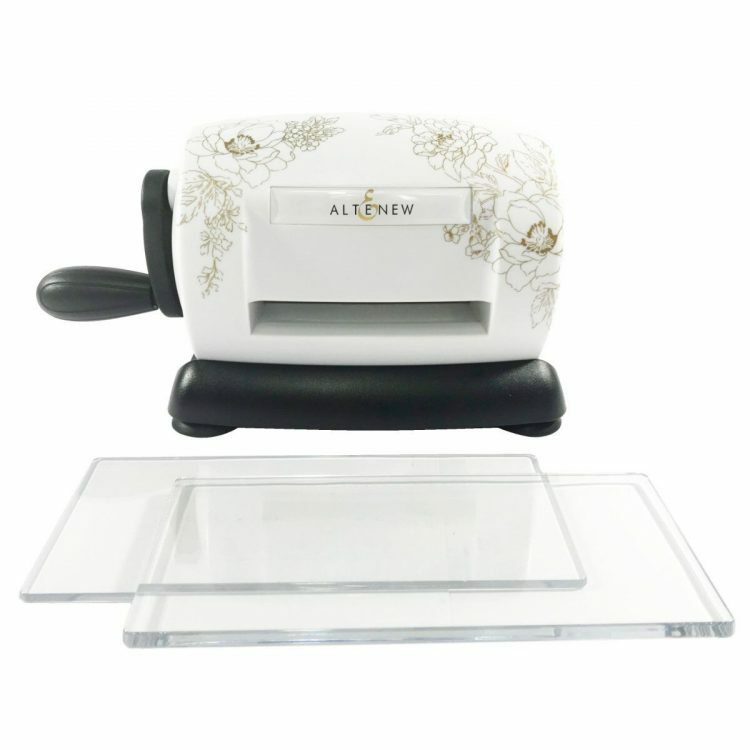 And yes, the new mini die cutting machine is too cute!